The state of Connecticut will spend up to $50 million to replicate the success of the Eastern Connecticut Workforce Investment Board’s Manufacturing Pipeline Initiative, created to strengthen the advanced manufacturing sector of its economy and respond to immediate employer demand for skilled workers. Public Policy Associates, Inc. (PPA) was selected to be an evaluation partner in developing and implementing the initiative. One of PPA’s specialties is workforce development and has provided independent evaluations for federally funded projects across the country. You can read more about PPA’s work in this field here. 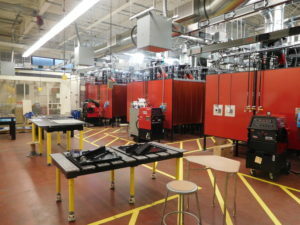 The Connecticut Department of Labor received a federal Workforce Innovation Fund grant to create the Manufacturing Pipeline Initiative, a demand-driven workforce development initiative providing classroom and industry-specific training to quickly prepare underemployed and unemployed workers for in-demand advanced manufacturing jobs in eastern Connecticut. You can read more about the Manufacturing Pipeline Initiative in this column in the Hartford Courant. For more information about PPA’s role, click here. For more information about PPA’s role in the project or to discuss how PPA can help in other workforce projects, contact Mr. McConnell at dmcconnell@publicpolicy.com or 517-485-4477.